This "Historically Speaking" column was originally published in the Exeter News-Letter on August 26, 2005. A few years back, the Exeter Historical Society received a request for genealogical information. An ancestor, it seems, had died in the area sometime in the summer of 1881 – would it be possible to search the back issues of the Exeter News-Letter to find the death listing? And so, down in the basement of our building in an area we refer to as “the newspaper morgue” I spent an afternoon hunting for a name in the papers. He was there, of course, but I’ve long forgotten the name. During the research, however, I got caught up in a national drama that occurred during the long hot summer of 1881. While Exeter’s residents were considering how to celebrate the Fourth of July, President James Garfield was planning a trip. As he readied himself to board the train in Washington, D.C., a disgruntled office-seeker stepped forward and shot him twice. How quickly this news reached Exeter is unknown, the newspaper was published only on Fridays. For the next eleven weeks, updates on the President’s condition were the talk of the town and the biggest news item featured in the paper. Initially, the doctors felt Garfield would live for at best a day. His wife was called and he seemed to deteriorate that evening. One of the shots had harmlessly grazed the President’s elbow, the other buried itself deep within his abdomen. He was examined at the train station and later transferred to the White House, where “precautions were immediately taken to preserve quiet and maintain order.” It’s a shame they didn’t also consider cleanliness, because the first doctor to examine him probed the wound with his unwashed finger and a dirty instrument in an attempt to find the bullet. He was unable to find it and the missing bullet became an obsession for Garfield’s doctors. 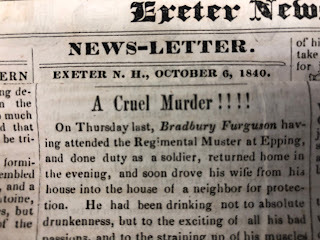 In Exeter, while the townsfolk were debating how to best remember the men who’d served in the Civil War fifteen years earlier, news of the President’s condition came in steadily. Washington, D.C. has a terrible climate in mid-summer. 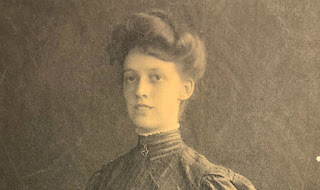 Lucretia Garfield, the First Lady had come down with malaria when she first arrived. To keep the feverish President cool, a crude air-conditioning system was rigged up which required 39 tons of ice each day – it would have used less, but the President insisted on leaving the windows open, an inclination shared by my kids. He was uncomfortable, but seemed to be in no real danger, so the doctors decided to go after the bullet again. Alexander Graham Bell was called to locate the bullet with his “electrical apparatus”. It worked great during testing, but Bell wouldn’t commit to its accuracy when used on the President. The doctors, however, were thrilled when the machine seemed to confirm the location of the bullet. On July 29, it was reported that the wound was again probed, much more deeply this time. Several “pus cavities” were located and drained and it was believed that the President had fared well. Within a week, it was obvious that he was gravely ill again. They blamed it on “stomach problems” and not the operation. Garfield had been given only milk mixed with rum for sustenance and this disagreed with him. Further attempts to locate the bullet ended with failure. By September, the nation had been essentially without a President for two months. Congress was set to re-convene and Garfield was moved to the New Jersey seaside to recuperate. The President died suddenly on September 19th after clutching his chest. An autopsy revealed that the bullet was far from where the doctors had suspected, safely encapsulated in tissue, having missed all major organs and arteries. Dr. Bell’s equipment had only managed to locate the bedsprings beneath the stricken Garfield. The President died from heart failure, brought on, no doubt, by infection and re-infection by probing doctors and malnutrition. His attacker, Charles Guiteau, tried to plead that although he’d shot the President, the doctors had actually killed him. An unsympathetic jury found him guilty anyway and he was hanged the following summer. Exeter held a day of mourning and an un-named by-way off Lincoln Street – also named for a slain President – was christened “Garfield Street”. Photo: The highly accurate historical re-enactment of the assassination of President Garfield. 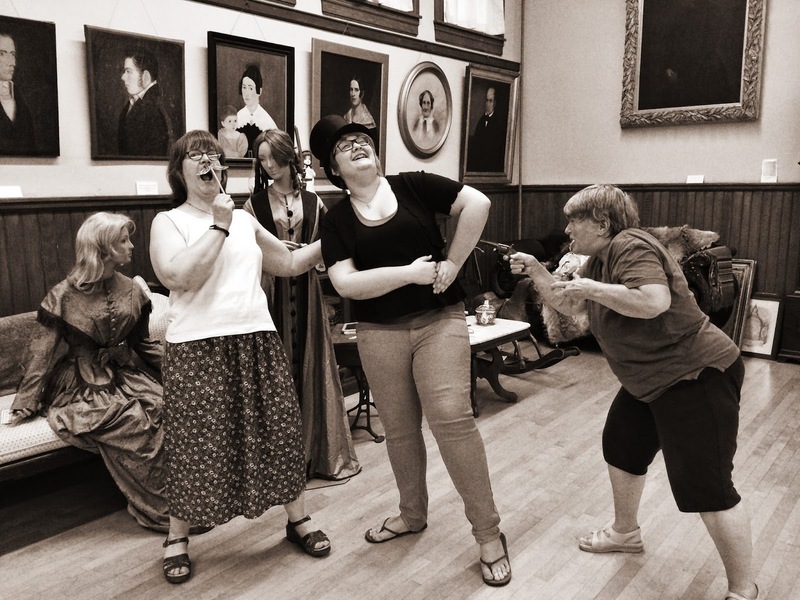 That's Trustee Pam Gjettum as Charles Guiteau, volunteer Alice Nickerson as the doomed President James Garfield and curator Barbara Rimkunas as Robert Todd Lincoln.